After one dud of a Sunday night game, Monday Night Football presents one more opportunity for prop bettors to get in the action. After Jared Goff, Todd Gurley and Mitchell Trubisky let them down in a big way, Kirk Cousins and Co. have a chance to light up the fireworks. After one dud of a Sunday night game, Monday Night Football presents one more opportunity for prop bettors to get in the action. After Jared Goff, Todd Gurley and Mitchell Trubisky let them down in a big way, Kirk Cousins and Co. have a chance to light up the fireworks. Here are five prop bets to consider for Monday night's game. ## Vikings vs. Seahawks MNF prop bets *Odds courtesy of Westgate LV SuperBook ### Russell Wilson passing yards: 235.5 Wilson sports one of the best touchdown-to-interception ratios in the NFL this season at 29-to-5 but with the Seahawks' running game taking a step forward this season, his passing yardage has left a bit to be desired. He's topped 300 yards once, two weeks ago in a 30-27 win at Carolina. But he's failed to hit even 200 yards five times this year, including three straight contests early in the season. ### Russell Wilson passing touchdowns: 2 Back to Wilson's touchdowns: after his second 34-touchdown season in three years in 2017, Wilson is on pace for a career high in the category. Wilson has multiple touchdown passes in 11 of 12 games this year, including a season-high four touchdowns last week against the 49ers. The Vikings aren't quite the imposing unit they were last year. Wilson could go off once more. 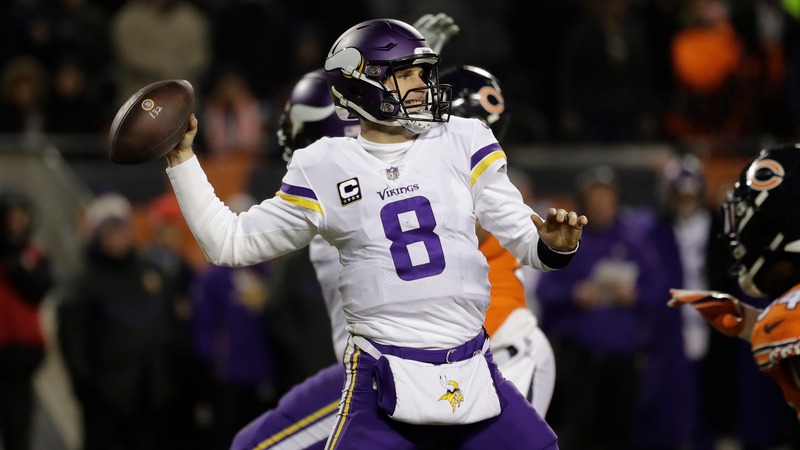 __MORE:__ [Vikings-Seahawks betting lines](https://www.betchicago.com/vikings-seahawks-betting-lines-odds-pick-mnf-point-spread) ### Kirk Cousins passing completions: 26.5 After attempting a season-low 22 passes in Week 9 against Detroit, Cousins is back to his pass-happy ways, completing 91 passes the last three weeks. Cousins has eight games with 30-or-more completions this season, and the Vikings have leaned on him lately. ### Kirk Cousins touchdown passes: 1.5 (OVER -160, UNDER +140) While the former Washington quarterback has lived up to some expectations since becoming the Vikings' franchise quarterback, Minnesota fans were probably hoping for fewer than the five one-touchdown games he's played this season. You don't break the bank for that. Cousins has fewer touchdowns than Wilson this year. __Another way to play:__ [MNF freeroll](https://betchicago.chalkline.com/games/nfl-mnf-challenge) ### Adam Thielen receiving yards: 92.5 No longer the Mr. Automatic he was earlier this year, Thielen's century-mark streak is a thing of the past. Aside from his eight-catch, 125-yard day against Green Bay in Week 12, he has 22, 66 and 28 yards in the other three games since his streak ended. If he and Cousins can rediscover their touch, Minnesota might make a postseason push.